Nicknames: Link, Slinky, Slinky Dinks, Dinks, Phanpy. Sire: Fin Ch, Lv Ch, Rus Ch Dagolas Naavaparta "Zeke"
Dam: Ch. Armahani Diamond Dansut (AI) RA JD HT ET FM "Veikko"
Lincoln or "Link" as she's more commonly known, is the daughter of our beautiful Veikko (aka Squiggle). 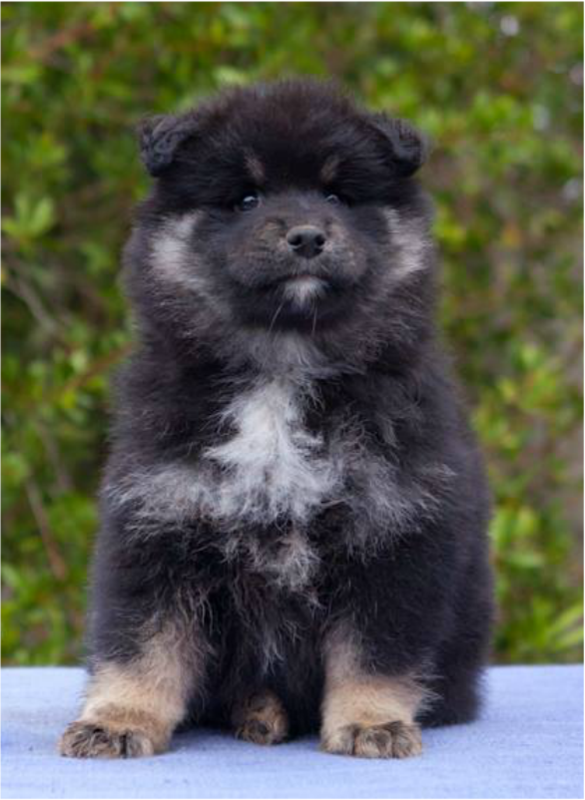 With Squiggle having achieved more in the performance ring in her early years than any other Finnish Lapphund in Australia, we knew that when the time came to add to our pack, we couldn't look past her daughter to carry on the dynasty! From the moment Link was born, she was the one I couldn't take me eyes off - the only little black and tan girl in the litter and so much like her mother in looks, I wanted to keep an open mind and not play favourites but it was pretty obvious to everyone that "Flash" was the one I was dying to bring home. While she grew, I was just waiting for something to happen, for her to have some issue or fault that would mean that she wasn't a suitable choice for our pack, but no matter what test or assessment we put in front of her, she passed every one with flying colours and pretty soon we knew that Flash was going to become Link! I could have cried with happiness the day that Jacq officially offered her to me. She is an absolute dream come true! Like her mother, Link is a perpetual ball of energy! She's always into everything and it's not uncommon to take something away from her, only to turn around and find that she has something else in her mouth. She absolutely adores toys and her ball and will often fall asleep surrounded by her treasures. She also loves pats and cuddles and will happily flop onto her back so she can snuggle into me at almost every opportunity. She has fit into the family like she has always been here and I struggle to remember a time before she squiggled her way into our lives. Link's back end is always going in a full body tail wag and I don't think I've ever met a puppy who is as naturally happy as she is. She is my fluffy shadow, following me around the house as I work and it's uncommon for me to turn around without finding her behind me. On those odd occasions where she isn't within cuddling distance, she can be found curled up on a couch or a bed with her little nose buried under her paws. She is certainly no stranger to life's comforts! In her foundation sports training, Slinky is very switched on and handler focused. She learns very quickly and makes huge leaps in learning without much repetition which makes her very easy to work with. While she is handler sensitive, she is not easily frustrated and switches easily from food to prey drive and back again in her work. All of these things put together, along with her natural ability to read my body language make me incredibly excited for her future in a wide range of dog sports. We have already begun the low-impact foundations for obedience, rally o, agility, herding, tracking, lure coursing and flyball. Slinky has taken to each of them like a duck to water and is always ready for a training session! I often have to remind myself to keep our sessions short because I'm yet to find the limits of her work ethic. Physically, Slinky is very much like her mother, though broader and heavier boned. She is a typey, petite girl with a compact body and correct movement. She has great rear end awareness and is light on her feet, built to work all day while remaining beautifully feminine and soft. I will be forever grateful to Jacq for giving me both of my beautiful girls and I can't wait to see all the fun things Link and I will be able to achieve together in the future!